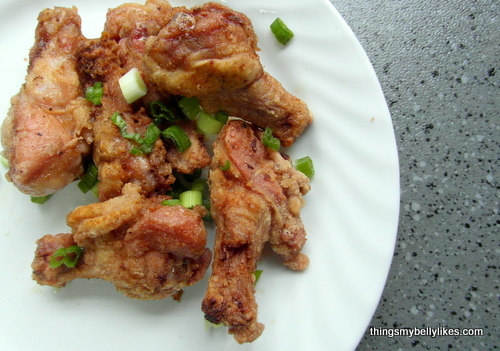 What with their egg drop soup and now these wings, they’ve really been hitting a series of home runs in our house. We are blessed with a wonderful, solid and joyous marriage but there is no union on earth that isn’t made stronger with the addition of fried wings. Put wings in a bowl and sprinkle with a tbsp of salt. Cover and put in the fridge overnight or for 6 hours. Rinse wings and pat dry. Set aside. Mix the flour, tsp of salt and black pepper in a resealable plastic bag. Shake to combine then add the wings (a few at a time or it will take you forever) and gently toss to coat. 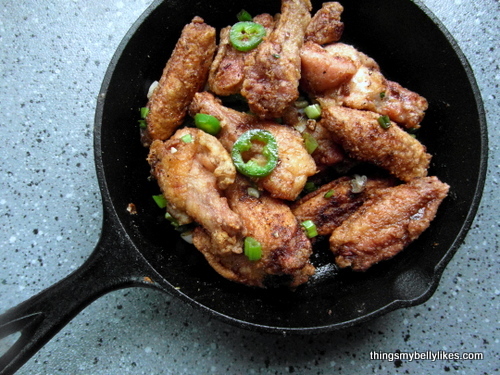 Shake off the excess and place wings on a cooling rack. Pour enough oil into a skillet/frying pan to around an inch deep. Heat over a high heat. When the oil is hot, carefully add the wings and fry for 5 minutes on each side until golden brown all over. Remove from pan. Drain most of the oil from the pan, reserving about a tbsp. Add the onion, garlic and jalapeno and reduce the heat to low. Gently fry for a minute then add the wings back into the pan and toss to combine. Serve. These look amazing! I have a serious weakness for chicken wings- I like that these are ‘healthier’ than traditional varieties. Thanks for sharing! Can I use ordinary bread flour ? There’s no arrowroot flour in my neck of the woods, even at a huge Asian supermarket here in my city. I can’t say for sure because I’ve never tried it, but I don’t see why not. The beauty of these is you can do a small ‘tester’ batch to see. If you can get cornstarch, that’s pretty much a straight sub for arrowroot so that might be worth a try too.